The next Summer Project I'll be working on is a cosmetic upgrade in my classroom library. At the end of last year I was feeling really proud of my bookshelves, and at the end of the day, they do work! They look all right, the kids can find things to read and they can find where to put them back when they're done. But here we are at the end of this year revisiting them. Like I said before, there's always room for improvement! Those new book bin labels are beautiful and they held up just fine! 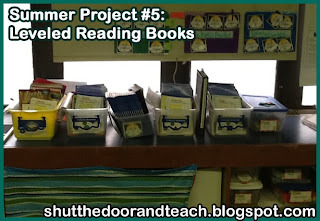 I don't want to change them at all unless it's to add to them (the kids will decide that when they organize the books at the start of the year). The location. 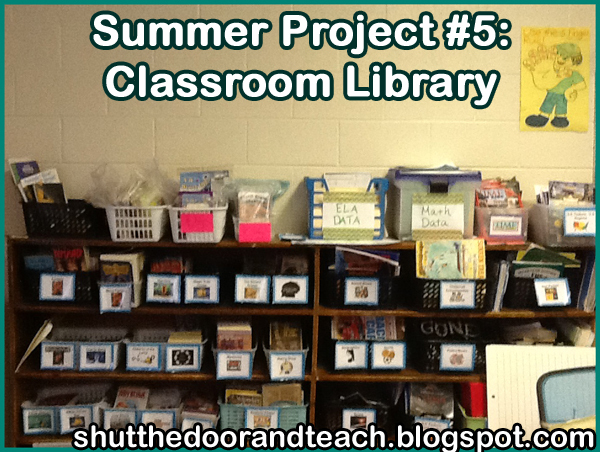 With closets and a sink on the right wall, window shelves on the left wall, and whiteboards in the front, the back is the only logical place for our library. The basic system. I mainly have fiction on the left and nonfiction on the right. Having the kids fine tune the organization the first week. I offer loads of guidance, but the bottom line is I still feel it's important for the kids to get to know our library that first week, and the best way to do it is to dig, sift, and sort through those books. I think I'll keep the leveled readers where they are on the adjacent wall on the window shelf. They just "felt" right there at the lower level, near our reading group area even though it's over the math area instead of on top of the library. There's also the added bonus that kids don't get confused and take them for independent reading. There are too many different colors of bins here. I want a more cohesive look. Since I'm taking the shoeboxes from the book shelves to use on the math manipulatives shelf, it's time to decide what style is staying, and what goes. The first step is to measure and the next is to think of cost. I have more black bins than anything else, so if I can find more of those, all the better! The white containers can then go on top to hold "special collections" like the social studies trade books. The white will blend right into the wall anyway. A quick fix, except it's one of the few that will cost a little money.